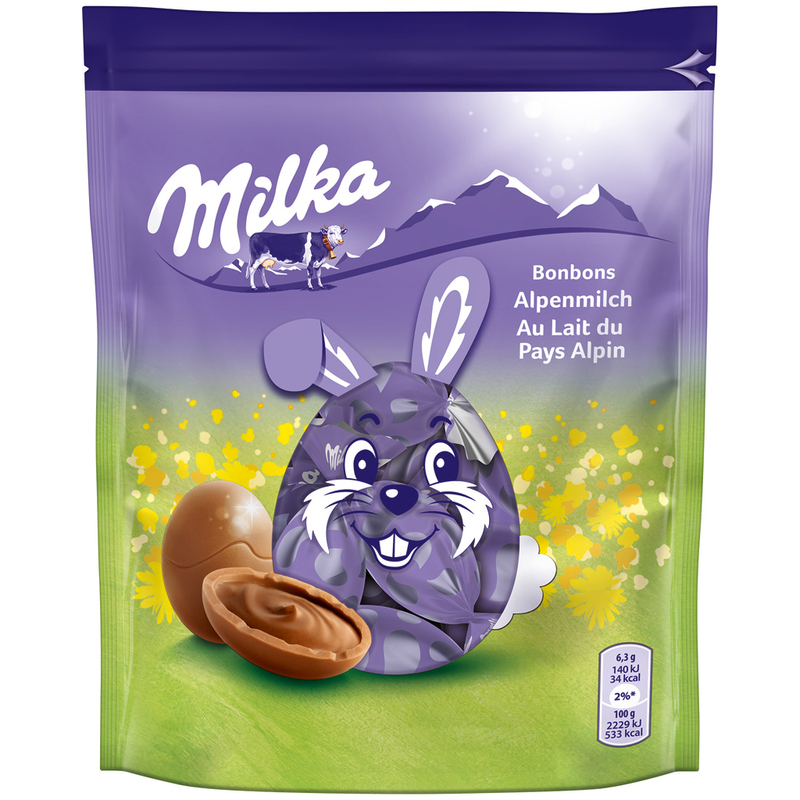 Individually wrapped chocolate candies made of the finest Milka Alpine milk chocolate. This delicious candies are the perfect treat for the Easter holidays. They are individually wrapped and made of the finest Milka Alpine milk chocolate. Very well suited for snacking, sharing and decorating the Easter baskets. 86g / 3.03 oz NET. WT. Sugar, cocoa butter, SKIMMED MILK POWDER, cocoa mass, SWEET WHEY POWDER (from MILK), BUTTERFAT, emulsifiers (SOY LECITHIN, polyglycerol polyricinoleate), HAZELNUTS, flavoring. Cocoa solids: at least 30%. May contain traces of other nuts, egg and wheat. Zucker, Kakaobutter, MAGERMILCHPULVER, Kakaomasse, SÜßMOLKENPULVER (aus MILCH), BUTTERREINFETT, Emulgatoren (SOJALECITHIN, E476), HASELNÜSSE, Aroma. Kakao: 30% mindestens. Kann Spuren von anderen Nüssen, Ei und Weizen enthalten.